1910's vintage Edwardian era earrings. Sterling and crystals. 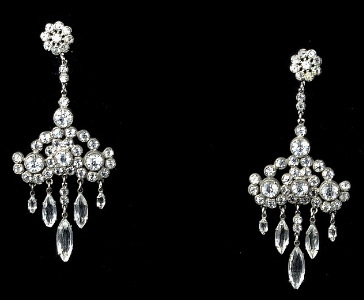 Chandelier drop earrings. Wide double scallop sterling setting centerpiece with round and marquis stones. Five graduated individual marquis drops from each centerpiece. Double tiny crystals link between screw back button and centerpiece. Round flower button at screwbacks. Marked STERLING on screw backs. All original Edwardian era, true 1910's vintage. Earrings screen worn by Charlize Theron as "ADELE" in motion picture production of BAGGER VANCE. Purchase include costumer's hold tag. Included with the purchase is a copy of the original Titanic rental inventory page listing the item & photo copy authentication between the production and Repeat Performance, documenting specifically item RP#100-149JLE, the identifiable inventory number of the earrings. Excellent condition. Just slight wear at settings.